The latest reviewed version was checked on 14 August 2017. There are 4 pending changes awaiting review. Throughout the animal kingdom, there are a huge variety of photoreceptor cells. Despite their differences they all work on the same principle: Since the visual pigments - the molecules responsible for detecting photons - can only be positioned at the cellmembrane, all photoreceptors form layers of membrane to capture enough photons. There are two basic classes of photoreceptor cells. In vertebrates (mammals, fish birds, reptiles, etc.) the visual receptors are derived from ciliary epithelial cells and are therefore called "ciliary receptors". They are further divided into rods and cones, with most vertebrates possessing both of them. Ciliary receptors pile their membrane in the outer segment (see figure). Arthropods (insects, crusteans, etc.) and molluscs (scallops, octopus, etc.) have tons of small, cylindrical microvilli which contain the visual pigments. These cylinders stick out from the cell body like bristles from a toothbrush. These receptor cells are called rhabdoms. Very few animals, e.g. scallops use both ciliary and rhabdomeric photoreceptors. "Rod visual pigment of a given species are spectrally placed to maximize photon capture in the natural environment"
Rods are responsible for dim light vision where the available light is of little intensity and it is important to be sensitive to the light available. This hypothesis was developed during investigations in deep-sea animals for which it holds very well. For all other habitats it is problematic. This graph shows how the spectrum in a terrestial habitat might change based on the time. Marine mammals show a much broader range of maximum absorbtion wavelength than terrestial mammals. While the rod pigments of terrestial mammals absorb maximally at around 500 nm, marine mammal absorbtion peaks between 480 to 505 nm. Deep foraging animals have visual pigments shifted towards the blue colors (λmax ≤ 490 nm) while mammals dwelling close to the coast have λmax -values close to land-dwelling animals. A picture of a coral reef taken at a depth of over 10 m. The corrected image shows how the coral reef might appear in broad daylight. For habitats other than the deep-sea the sensitivity hypothesis falls short. Already in clear water close to the surface the environments spectrum would predict visual pigments with a maximum absorbance at higher wavelength than actually encountered. No vertebrate has rods with a maximum absorbance at a wavelength beyond 525 nm even though the light intensity increases continually for higher wavelength. Most rod absorbances peak near 500 nm or less. Insects (even if they are active during the night) do not have photoreceptors with an absorbance peak beyond 545 nm. An eye is considered to be a "true eye" if it is capable of spatial vision i.e. it has to have some form of spatial resolution and imaging. An eye spot for example - a simple patch of photoreceptors - is not considered a true eye as it can only detect the presence of light but cannot locate its source exept maybe as a coarse direction. These eyes do have their use: A burrowing animal could use it to detect when it breaks the surface, it could inform an animal, whether it has entered or left the shadows or it could use it as a means to detect dangerous levels of UV irradiance. In the following we will focus on true eyes. All true eyes have photoreceptors at unique positions in the retina and receives light from a restricted region of the surrounding world. This means each photoreceptor works as a pixel. To restrict the region of space from which the photoreceptor receives light, all true eyes possess an aperture or pupil. In an animal the size of the eye is governed by energetic needs - bigger eyes need more upkeep. In an eye of a given size there is inevitably a tradeoff between resolution and sensitivity. High-resolution vision requires small and dense pixels/photoreceptors which are susceptible to noise at low light intensities. A nocturnal animal might therefore evolve coarser pixels that gather more light at the cost of reduced resolution. being the standard deviation. While the human eye is able to perceive as few as 5 to 15 photons, it is impossible to see any features beyond the existence of the light source. 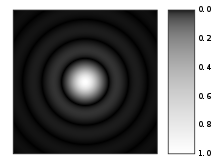 The de Vries-Rose square law describes how the contrast increases with the SNR. This means that the minimal contrast that can be perceived is set by shot noise. Transducer noise Photoreceptors are unable to respond to each absorbed photon with an identical electrical signal. Dark or thermal noise As already discussed above, another source of noise is the random thermal activation of the biochemical pathways transducing the photons. Baylor et al. identified two components of the dark noise: A small continuous fluctuation and event-like spikes indistinguishable from the arrival of photons attributed to the thermal activation of a visual pigment. Here A is the diameter of the aperture (pupil), f is the focal length of the eye and d, l and k are the diameter, length and absorbtion coefficient of the photoreceptors, respectively. In the above equation, the fraction of light absorbed has been calculated for daylight. In the deep sea, the light is mostly monochromatic blue light of 480 nm, and therefore the fraction can be replaced by the absorptance. The absorption coefficient k describes the fraction of light a photoreceptor absorbs per unit length. Warrant and Nilsson (1998) give some values for k that range from 0.005 μm-1 for a house fly to 0.064 μm-1 for deep sea fish, with human rods at 0.028 μm-1. Interrestingly, he also notes that the values for vertebrates are five times higher than the values of invertebrates living at the same light intensities. By studying the sensitivity equations we can see that strategies for increasing sensitivity include big pupils (big A), small focal length (f) and larger photoreceptors (d,l). Since big pupils correlate with a bigger focal length, bigger eyes do not automatically provide better sensitivities than small eyes. The nocturnal moth Ephestia eyes are almost 300-times more sensitive than human eyes, despite it's eye being tiny. The table below gives an overview over the huge range of sensitivities found in nature. S = Sensitivity, Δρ = photoreceptor acceptance angle from the equation , A = diameter of aperture; d and l = diameter and length of the photoreceptor; f = focal length. From Visual Ecology (2014). Notes : S has units μm 2 sr. Δρ is calculated using equation below and has units of degrees. . See chapter 5 for a full description of eye types. a Focal length is calculated from Matthiessen’s ratio: f = 1.25 A. b Rhabdom length quoted as double the actual length due to the presence of a tapetum. c S was calculated with k = 0.0067 μm –1 , using equation for monochromatic light. All other values were calculated with equation for broad-spectrum light. d Values taken from frontal eye. e Posterior medial (PM) eye; f Anterior lateral (AL) eye. Source: Visual Ecology, 2014.
where d is the diameter of the photoreceptor and f is the focal lenght. This equation tells us that a bigger eye can achieve better resolution, as it has a higher focal length while the size of the photoreceptors stay the same. Essentially, resolution can be increased by cramming as much receptors as possible on the retina. Birds of prey have much higher visual acuity than humans. The eye of an eagle for example is a big as a humans eye which means it is much bigger relative to body size, but it has a far higher density of photoreceptors. There are of course further restrictions. Much like in photography eye lenses are associated with a number of errors. Diffraction blurs the image. A point-like light source (e.g. a star in the night sky) is projected on a bigger point with faint circles around it. This image is also called an Airy Disk. This blurres the vision, when the light from the point source is projected to multiple photoreceptors. Computer-generated image of an Airy disk. The gray scale intensities have been adjusted to enhance the brightness of the outer rings of the Airy pattern. Chromatic aberration The refractive index n is a function of the wavelength. This means that a lens fails to focus all wavelengths on the same point. Some spiders have adapted to use this for depth perception. The jumping spider has a retina consisting of four layers on each of which light of different wavelengths is focused. Nagata et al. found green photoreceptor in both the deepest and the second-deepest layer, even though the green light is focused on the deepest layer. This means that the green image in the second-deepest layer is always out of focus. From the mismatch between the layers, the jumping spider gains depth perception. Some fish have evolved to compensate for chromatic aberration with multifocal lenses.<ref>Kröger et al. (1999), Multifocal lenses compensate for chromatic defocus in vertebrate eyes. Spherical aberration Since real lenses are unable to focu incoming paralell light in a point an error called spherical aberration occurs. Adaptations that circumvent this problem include non-spherical lenses (even though this creates other problems) and lenses with a graded reflective index. Another problem that will not be discussed here, is the optical cross talk between photoreceptors. ↑ Fasick JI, Robinson PR. (2000), Spectral-tuning mechanisms of marine mammal rhodopsins and correlations with foraging depth. ↑ Pirenne, M.H. (1948), Vision and the Eye, Chapman and Hall, Ltd.